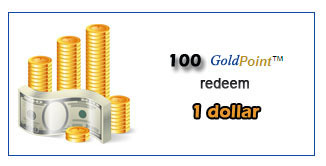 GoldPoint™ are rewarded for purchase, reviews, posts, create account and other promotional campaigns. For purchase reward, GoldPoint ™ are issued to any purchased order, shipping fee excluded, at the rate of 1 dollar to 1 point and only integral amount is accounted. -For example, an order of $11.99, $10.00 for items and $1.99 for Registered Air Mail + Tracking Number shipping, you will get 10 points for the purchase. For review reward, GoldPoint™ is issued to confirmed reviews. Please note that though we are glad to see reviews from any visitor, to see more. On checkout page, you can redeem GoldPoint™ to reduce order price. You can redeem GoldPoint™ as much as 50 percent of the order amount. And for an order partial paid by GoldPoint™, the redeemed price would not be issued GoldPoint™ to. -For example, the order total you have placed is $2, you can pay for it with 200 GoldPoint™.